NASA. National Aeronautics and Space Administration. The place every eight year old wants to work. They want to ride in the spinning machines. And they want to touch the stars, taste moon dust, and be the first person to walk on Mars. You remember being that eight year old looking up at the night sky, wishing that you were up there where no man had gone before. That night, when you were looking up, you made a promise to yourself: you would get to those stars. The next day you started your training on the playground. You pushed yourself to get into the best physical condition of your young life. Now you are an adult, and you are ready to follow your dreams. So grab this Men's Orange Astronaut Costume, and be an astronaut. Channel the eight year old you, the eight year old in all of us, and get to the stars. We don't suggest tasting moon dust, but if you do let us know what it tastes like. Again, we don't suggest it, but we also want to know. 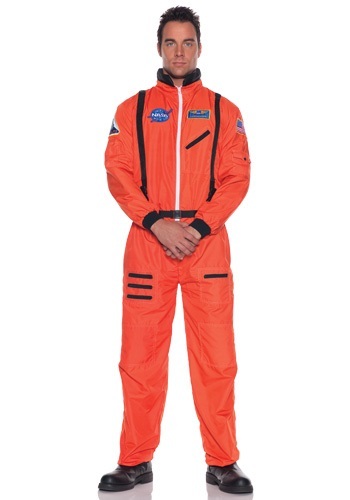 Get yourself up to the stars, but stay safe in this orange suit. We need you to come back, and tell us what you have seen where no man has gone before.